August 23, 2010 - westernstandard.ca - Paul McKeever: McGuinty's MMA Flip-flop a Way of Securing Pan Am Stadium for Hamilton? June 23, 2010: "The Right Fix for the HST: Scrap the $2.9B Health Premium"
"Eliminating Ontario's Health Premium would make the July 1st, 2010 imposition of Ontario's Harmonized Sales Tax (HST) almost revenue neutral", says Freedom Party of Ontario leader Paul McKeever. "I am calling upon the Premier to eliminate the Health Premium as soon as the Legislature can effect that change..." Click here to read the full media release. May 20, 2010 - Just Right radio show with hosts Robert Metz and Robert Vaughan, CHRW-FM, London [.wma AUDIO - www.justrightmedia.org]: From 'Prince Of Pot' To 'King Of Pot' - Marc Emery Extradited! April 29, 2010 - Just Right radio show with hosts Robert Metz and Robert Vaughan, CHRW-FM, London [.wma AUDIO - www.justrightmedia.org]: Waiting Lists For Organ Transplants: Why Not Try Capitalism? March 10, 2010 - Paul McKeever's blog: Toronto's 2015 Pan Am Games to Cost Taxpayers $11.6B? [Media Advisory] - "Just after midnight tonight, Ontario lawyer Paul McKeever will release Part 1 of “The Principle of Pot”, his new two-part documentary about the nature and motives of Marc Emery, the media-dubbed Prince of Pot..." Click here to read the full media release. January 6, 2010 - On The Line (CTS) with host Christine Williams and panelist Paul McKeever [VIDEO]: Job Security for Cops Who Commit Fraud? October 23, 2009: "Cancellation of Tax-Funding for Pan Am Now a Pressing and Obvious Necessity"
"Cutting taxpayer funding for Toronto's 2015 Pan Am Games bid is the most time-sensitive and obvious cut that the Ontario and federal governments could and must make says Freedom Party of Ontario leader Paul McKeever..." Click here to read the full media release. September 12, 2009: "Religion, Power, and Taxes"
"Paul McKeever today released the final three planks of his St. Paul's by-election platform..." Click here to read the full media release. September 3, 2009: "REPEAL FORCED RETAIL CLOSINGS"
"As the province heads toward Labour Day weekend and Jewish and Muslim high holidays, St. Paul's by-election candidate Paul McKeever today announced that, if elected, he will work to repeal what is left of the Retail Business Holidays Act..." Click here to read the full media release. 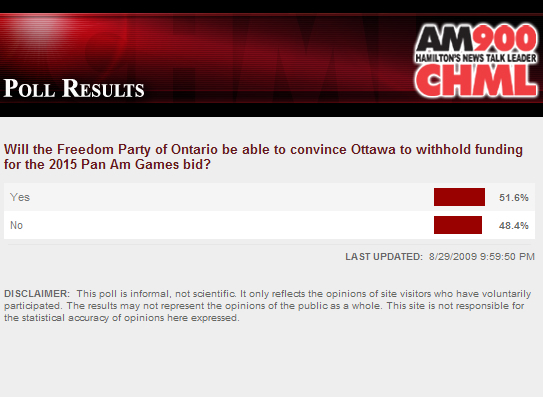 August 29, 2009 - AM900 CHML: Poll Results - Will the Freedom Party of Ontario be able to convince Ottawa to withhold funding for the 2015 Pan Am Games bid? "Freedom Party of Ontario today announced that Paul McKeever will be its candidate for the September 17, 2009 by-election being held in the Ontario provincial riding of St. Paul's. McKeever is the leader of Freedom Party of Ontario..." Click here to read the full media release. "With CO2 emissions talks slated to be the focus of the Council of the Federation meeting of 13 provincial and territorial leaders tomorrow, Freedom Party leader Paul McKeever today is condemning Ontario Premier Dalton McGuinty's willingness to found government warnings, legislation or policy upon unfounded presumptions..." Click here to read the full media release. "The fact that Dr. Zaretsky could consider an alleged psychic's allegation to be "reasonable grounds" may be astounding. Nonetheless, if it is the case that some doctors might consider irrational, mystical mumbo-jumbo to be "reasonable grounds", justice dictates that it is incumbent upon the Ontario government to introduce legislation which makes it clear that allegations completely unsupported by physical evidence or eyewitness testimony; allegations founded upon allegedly mystical insights or divine revelations; are never to be considered "reasonable grounds" for the purposes of any law of Ontario, including the Child and Family Services Act..." Click here to read the full media release.
" Freedom Party leader Paul McKeever today condemned Ontario MPPs' decision today to say more prayers as part of the daily law-making proceedings in the Ontario Legislature..." Click here to read the full media release. "By removing observances of the allegedly supernatural from our legislative proceedings, we strengthen our commitment to democracy. If we keep prayer simply because 30,000 want it, we are implying the counter-democratic view that that the only limit on god-given governmental authority is the whims of the majority..." Click here to read the full media release. January 25, 2008: Open Letter to Premier Dalton McGuinty Re: "Africentric Alternative Schools"
"I am asking you, in particular, to introduce legislation that will remove from all publicly funded educational organizations the authority to set up schools that - as I have described above - foster racism, career failure, and educational segregation..." Click here to read the full media release. "Freedom Party of Ontario leader Paul McKeever (candidate for London West) says John Tory has abandoned both sides of the religious school funding debate..." Click here to read the full media release. "FP leader Paul McKeever (candidate in the riding of London West) says that, two years after releasing his party's platform, he remains flip-flop free, and he continues to stand by his party's proposals...." Click here to read the full media release. "With the opening today of advance polls, Freedom Party leader Paul McKeever commenced a billboard campaign that will put his candidacy front and centre in the minds of voters in London West..." Click here to read the full media release. "For voters and reporters who have not had the opportunity to attend the local debates, and for those reporting on the activities of party leaders during this election, we provide this list of recordings that have been made in London ridings, and which can now be found on the web..." Click here to read the full media release. "Freedom Party leader Paul McKeever (candidate in the riding of London West) today is warning that the Progressive Conservative proposal to fund religious schools with taxpayer dollars would deprive participating religious schools of constitutionally-entrenched protections of their religious freedom." Click here to read the full media release. "Freedom Party of Ontario leader Paul McKeever today announced that Freedom Party has nominated Kingston resident Mark Fournier as its candidate for the riding of Kingston and the Islands for the coming provincial election. The 54 year old Fournier is co-founder of Canada's most influential political discussion forum, www.freedominion.ca." Click here to read the full media release. "Freedom Party of Ontario leader Paul McKeever today wants some answers from PC leader John Tory, after at least one PC candidate has chosen to hide behind the courts in defence of the PC party's disastrous proposal to fund private religious schools..." Click here to read the full media release. "Freedom Party today released its first video election message for the 2007 Ontario general election..." Click here to read the full media release. "With the Ontario provincial election fast approaching, a tally of statistics drawn from the popular video website www.youtube.com shows the general viewership's interest in Freedom Party's videos outstrips interest in videos produced by the Progressive Conservatives and Liberals..." Click here to read the full media release. "Freedom Party leader Paul McKeever today is condemning John Tory's election promise to 'use the information gathered through [medical patient history and care] records to improve healthcare delivery, forecasting and planning in Ontario'...." Click here to read the full media release. "...I am writing both to explain why Freedom Party will not answer the questions put to it in the form, and to provide a substantive answer concerning how the Chief Electoral Officer can and must comply with the relatively new obligation set out in subsection 4.2(1) of the Election Act..." Click here to read the full letter. "Freedom Party leader Paul McKeever today is commending the McGuinty government for adoptng his May 15, 2007 proposal concerning the wording of the October 10, 2007 electoral reform referendum question..." Click here to read the full media release. "Freedom Party today released a video that exposes the folly of Progressive Conservative leader John Tory's proposal to fund private religious schools (but not non-religious schools) with tax revenues..." Click here to read the full media release. "Freedom Party of Ontario leader Paul McKeever today is calling a proposal to fund faith-based schools with tax revenues a step in the wrong direction...." Click here to read the full media release. "Freedom Party of Ontario today released a video slamming the Progressive Conservatives' recently-announced election plank to give Ontario farmers $300M...." Click here to read the full media release. "Freedom Party today released a video that takes aim at gasoline "price gouging" conspiracy theorists, and that condemns Ontario's newly-introduced private member's Bill 228, which is titled the Gas Prices Notice Act, 2007..." Click here to read the full media release. "Freedom Party of Ontario leader Paul McKeever is condemning John Tory's statement today, in a media release, that gasoline companies should have to 'do a better job of justifying...their prices to the public'..." Click here to read the full media release. May 17, 2007 - Freedom Party of Ontario's YouTube Channel: FPTV - Ep. 10: Who Do Ya Love? "Freedom Party of Ontario leader Paul McKeever is condemning the recommendations set out in a report by Ontario's Citizens' Assembly on Electoral Reform..." Click here to read the full media release. "Freedom Party today released a video that accuses the McGuinty government, and Tory opposition, of using global warming as an excuse for electricity rationing that actually is the result of mismanaging electricity in the province..." Click here to read the full media release. "Freedom Party today released a video to encourage members of Ontario's Citizens' Assembly on Electoral Reform not to recommend replacing Ontario's Single Member Plurality (SMP or "first past the post") electoral system with the Mixed Member Proportional (MMP) system..." Click here to read the full media release. March 29, 2007 - Freedom Party of Ontario's YouTube Channel: FPTV - Ep. 7: What's Wrong with Raising the Minimum Wage? "One week following the release of Ontario's 2007 budget, Freedom Party today announced the release of its new video titled "The Minimum Wage" which highlights both moral and economic problems associated with raising Ontario's minimum wage..." Click here to read the full media release. "Freedom Party leader Paul McKeever today said that raising the minimum wage is immoral because it will make it illegal for even more individuals to trade their labour for the economically rational prices that employers will pay..." Click here to read the full media release. "Freedom Party today released a two-part video titled "The Property Tax Issue" that aims to explain property taxation to Ontarians and to promote a better, alternative system of municipal taxation..." Click here to read the full media release. "With just 6 months to go before the dropping of the election writ in Ontario, Freedom Party is challenging those who are currently campaigning as "promise-keepers" without even having released their party's election platform..." Click here to read the full media release. February 27, 2007 - Freedom Party of Ontario's YouTube Channel: FPTV - Ep. 5: So Ya Wanna Be a Promise Keeper, Eh? February 23, 2007 - On The Line (CTS) with host Christine Williams and panelist Paul McKeever [VIDEO]: What Makes Private Health Care Private? February 21, 2007: How Many Dim Bulbs Does it Take to Ban a Light Bulb? "Freedom Party leader Paul McKeever today condemned the idea, floated today, of banning incandescent light bulbs..." Click here to read the full media release. "Freedom Party leader, Paul McKeever, was in Burlington today as a guest on CTS's popular afternoon talk show On the Line with Christine Williams..." Click here to read the full media release. "Freedom Party today confirmed that it will be bringing its 'Lower Taxes, a Better Life' campaign to voters in all three Ontario by-elections to be held on February 8, 2007. 'Freedom Party's candidates will make sure that these by-elections are not what journalist James Travers today described as a Seinfeld Election: an election about nothing', says Freedom Party leader Paul McKeever..." Click here to read the full media release. "Hours before leaving with a trade delegation to India, the birthplace of Buddhism, it was announced that your government has scheduled February 8, 2007 as polling day for by-elections in three electoral districts in your home province of Ontario, Canada. As you should know, February 8, 2007 is the date on which many Buddhists observe Parinirvana (also known as Nirvana Day), which marks the death of Buddha..." Click here to read the full media release. January 2, 2007: John Tory One Toke Over the Line? "Freedom Party of Ontario today released a 9 minute video that jabs John Tory for his hypocritical attempt to appear tough on marijuana; an attempt that quickly backfired on Tory just a few weeks ago..." Click here to read the full media release. December 12, 2006 - Freedom Party of Ontario's YouTube Channel: FPTV - Ep. 3: "Mandatory Retirement"
"Freedom Party of Ontario today is again condemning the Ontario government's alleged ending of "mandatory retirement" as a misguided fraud. In today's episode of FP Television http://www.youtube.com/watch?v=dYUKLgWWris), FP leader Paul McKeever takes exception to the fact that the McGuinty government is selling the new law on the false basis that it eliminates mandatory retirement in the private sector...." Click here to read the full media release. "Freedom Party leader, Paul McKeever, is expressing support for the McGuinty government's introduction of electoral reform legislation that – in effect - decreases the likelihood of a change to a "proportional representation" electoral system..." Click here to read the full media release. October 13, 2006 - Freedom Party of Ontario's YouTube Channel: FPTV - Ep. 1: Why not join the Progressive Conservatives? "Freedom Party of Ontario today has launched "FPTV", a "channel" on the popular website YouTube.com: http://www.youtube.com/fpontario . FPTV will facilitate publicly-viewable two-way communications between party leader Paul McKeever and those who would like him to address questions or comments concerning the party, its leader, and the governance of Ontario...." Click here to read the full media release. "Increasing competition between health care providers of OHIP benefits might lower costs if they are also required to compete with one another but, even with competition between health care providers, it will do nothing to fix the real problem facing Ontario's health care system..." Click here to read the full media release. "Once again, Mr. McGuinty and Mr. Tory are spreading the false notion that the provincial government is powerless and that it's someone else's problem", said McKeever...." Click here to read the full media release. Issue #37 of Freedom Party of Ontario's official newsletter, Freedom Flyer, is now available online in .pdf format. In this Issue: Freedom Party launches 2007 election platform on October 4, 2005: exactly 2 years prior to 2007 election polling day. Openers: Some Frank talk about Freedom Party and freedom. Tax Targeted (London Free Press). In-your-face billboards speak directly to Ontario voters. Freedom Party 'mystery' dinner excites, delights attendees. Freedom Party Kicks Off Campaign (London Free Press). Dinner attendees meet 'Frank' - Freedom Party's new mascot. Who must you be to be Frank? A message from Paul McKeever, Leader, Freedom Party of Ontario. Consumption Tax Cure for Revenue Gap (a column by Paul McKeever, published in the Financial Post). Scoring Points in Battle of the Gap (Toronto Star). The Riding Where the Toughest Job is Being Right (National Post). Ontario by-elections a sobering reminder of voter and media inertia. By-elections a Gauge for McGuinty (Toronto Star). Constituency associations: every candidate needs one. Click here to go to the download page. On September 1, 2006, FPO leader Paul McKeever was a guest on the John Oakley Show (AM 640, Toronto). Oakley spoke with McKeever about McKeever's August 31, 2006 column in the Toronto Star concerning the fact that both the Liberals and the Progressive Conservatives take the absurd position that the Premier's office has no constitutional authority to direct the police to remove occupiers from the disputed land at Caledonia. Alone among political party leaders in Ontario, McKeever said that the premier's office can and should direct police to remove occupiers from the disputed land with force if necessary, and that no negotiation should occur while the land is occupied. Click here to hear the interview. "...Tory's supposedly "hard line" that negotiations should cease until the rule of law is restored is, in truth, hypocritical bafflegab: He proposes that McGuinty restore the rule of law by sitting down with First Nations leaders and working out a way in which to restore the rule of law. Now, I'm just a lawyer, but I would call that a form of negotiation...". Click here to read the column. "Freedom Party candidate Silvio Ursomarzo today is expressing concerns about NDP candidate Cheri DiNovo's silence in response to comments made by her "team" member, federal NDP MP Peggy Nash...." Click here to read the full media release. "...Freedom Party's candidate, Silvio Ursomarzo, today wrote to DiNovo demanding to know whether she shares Ms. Nash's position on Hezbollah..." Click here to read the full media release. "Freedom Party of Ontario today has announced that Silvio Ursomarzo has been nominated as the Freedom Party candidate in the Ontario provincial riding of Parkdale-High Park..." Click here to read the full media release. "...I write to you today about my concern that both of you are endangering both the rule of law and democracy by taking the same stand on a single issue: the role of government in the direction of policing operations..." Click here to read the full media release. "Freedom Party of Ontario leader Paul McKeever today enraged CUPE Ontario President Sid Ryan by asserting it is appropriate for Israel to attack terrorists even when they are embedded with numerous innocent human shields. ...." Click here to read the full media release. "...The government is essentially declaring that coercion is morally equivalent to trade; that, in terms of ethics, thinking, working and producing an income in order to live and pursue ones own happiness is a vice, whereas it is a virtue to have a government steal money for you, from the pockets of those who earn it; a vice to take by force if you wear a fedora, a virtue to do so if you wear a crown. But, in truth, had a Tony Soprano done this for Linamar, our moral evaluation of the government could not rationally be any different...." Click here to read the full media release. "...For decades, Ontario's Progressive Conservative, Liberal, and NDP governments have told us that if not everybody can swim, the government must tie everyone to the deck of the HMCS OHIP and force everyone to sink along with her. Mass suffering and murder, they have told us routinely, are morally superior to the survival and happiness of some..." Click here to read the full media release. "...Freedom Party leader Paul McKeever is today objecting to the McGuinty government's decision to give the taxpayer's money to religious organizations..." Click here to read the full media release. "...Mr. Tory’s proposal harms efforts to achieve real tax relief because the proposal is based on a fraudulent assumption: that the health care premium was introduced to put more money into health care, rather than just to increase revenues overall...." Click here to read the full media release. "...Whereas the Liberals' Judi Longfield and Progressive Conservatives' Christine Elliott have been campaigning on more taxpayer funding for a failing government health insurance monopoly (OHIP) that is reducing rations, McKeever has been campaigning on lower taxes and the restoration of public/private choice in health insurance..." Click here to read the full media release. "Cutting Taxes and legalizing better health care, top Freedom Candidate's platform...." Click here to read the full media release. "Freedom Party candidate and leader Paul McKeever today is challenging the Progressive Conservatives' Christine Elliott and the Liberals' Judi Longfield to take clear and unequivocal stands on the issues..." Click here to read the full media release. "Freedom Party candidate and leader Paul McKeever today unveiled details of his property tax election plank. Under the proposal, property taxes would be scrapped and replaced with a municipal premium collected with the already-existing PST..." Click here to read the full media release. "Freedom Party candidate and leader Paul McKeever today said that, in nominating the spouse of federal finance minister Jim Flaherty, the Progressive Conservatives have ignored the serious conflict of interest that Christine Elliott's election to provincial office would trigger..." Click here to read the full media release. "Freedom Party candidate and leader Paul McKeever today is challenging Liberal candidate Judi Longfield to disclose to Whitby-Ajax voters her motive for running for provincial office...." Click here to read the full media release. "Freedom Party leader Paul McKeever is today condemning Minister Monte Kwinter's recently introduced emergency management bill, and the moral beliefs upon which it is founded..." Click here to read the full media release. on legalizing faster, better health care...." Click here to read the full media release. "McKeever's Campaign Slogan: Lower Taxes, A Better Life...." Click here to read the full media release. February 17, 2006: Just Say No to "Vulture Culture"
"Freedom Party of Ontario leader Paul McKeever today condemned NDP MPP Peter Kormos' private member's bill which, if passed, would presume a dead or dying person has consented to the harvesting of his organs...." Click here to read the full media release. "Freedom Party of Ontario is launching a new offensive in its 2007 election campaign: a six-part video that shows party leader, Paul McKeever, speaking with leading Ontario television personalities during election 2003..." Click here to read the full media release. "Recent comments by Progressive Conservative opposition leader John Tory, about who and what is responsible for murders and murderers in Toronto, have insulted millions of Ontarians, says Freedom Party leader Paul McKeever. They have also helped leftists to promote the growth of government by sowing the seeds of social discord...." Click here to read the full media release. "Pardon me ladies and gentlemen, but with 11 paragraphs about who should pay for snack food, Mr. Tory has unwittingly provided us with a black and white demonstration of what is actually undermining Ontario's confidence in the political process..." Click here to read the full media release. "Freedom Party of Ontario leader, Paul McKeever, says that Ontario opposition leader John Tory's handling of the Greg Sorbara matter exposes flaws in the judgment, class, and character of Mr. Tory..." Click here to read the full media release. "Freedom Party of Ontario will today become the first provincial party in Ontario to launch its election platform and campaign for the 2007 general election. ..." Click here to read the full media release. "The murderous gangsters among us are parasites, and they will continue to feed on all that is good in Ontario until nothing but misery and fear remain. Police action, not politicians' ribbon-cutting ceremonies on inner-city basketball courts, will prevent the spread of this menace..." Click here to read the full media release. "Freedom Party of Ontario leader, Paul McKeever, opposes the Government of Ontario's decision, announced today, to grant $520 million to private businesses involved in setting up new ethanol production plants in Ontario..." Click here to read the full media release. "Freedom Party of Ontario leader, Paul McKeever, praised the Supreme Court of Canada's decision today which declared unconstitutional a Quebec law prohibiting individuals from spending their own money on health care services. His party views the decision as added fire-power for its unique stand on the issue leading into Ontario Election 2007..." Click here to read the full media release. June 7, 2005: The Fraud of "Ending Mandatory Retirement"
"...Freedom Party of Ontario Leader, Paul McKeever, says the government, with the opposition's assistance, is engaging in a political fraud: that the public is being misled so that they will embrace legislation designed to load government costs onto the backs of employees and private sector employers..." Click here to read the full media release. "Prime Minister, as you know, there are times to fight, times to concede defeat, and times to declare a draw. I respectfully submit that, in the interest of all Canadians, this is a time in which to declare a draw..." Click here to read the full media release. "I would ask your Excellency to consider, also, the importance of prompt, decisive action by the Governor General in preserving the monarchy and maintaining the unity of the federation..." Click here to read the full media release. "I would respectfully submit that, as guardian of our Parliamentary system and of the rule of law, your Excellency has the responsibility of protecting Canadians from a violation of the principle of Responsible Government. ..." Click here to read the full media release. "I am writing to ask that you reconsider the wisdom of your respective campaigns to get the federal government to direct five billion dollars of federal revenues into Ontario's purse, and that you both change your message to Ottawa..." Click here to read the full media release. "...The Harris-Manning proposals are backed by research by well-respected economists", says McKeever. "And, because many of the bold policies proposed by Misters Harris and Manning virtually mirror those set out by Freedom Party in its provincial and federal election platforms, Freedom Party is feeling somewhat vindicated today..." Click here to read the full media release. "...As I have maintained since before the imposition of the Eves-McGuinty 4.3 cent price cap", says Freedom Party of Ontario leader, Paul McKeever, "price controls do not control prices in the long run: they inflate prices in the long run..." Click here to read the full media release. motion in the Ontario Legislature:..." Click here to read the full media release. "As you know, for over two months, Ontario's Premier, Dalton McGuinty, has been demanding that the federal government provide additional revenues to the Ontario provincial government..." Click here to read the full media release. "...A municipal government that overtaxes will be directly responsible for the political and economic consequences of that taxation...This plan says to home owners: 'You have already paid for your home. You no longer have to pay rent to the government to keep it'..." Click here to read the full media release. "...The role of the opposition, first and foremost, is to identify what is wrong about government policy and to champion what is right, as a solution....." Click here to read the full media release. "...The real and important issue here is who has the power to choose what happens to privately owned land: the government or the people who own the land? I side with the landowners....." Click here to read the full media release. "...Tory's proposed system is known to economists and politicos as 'corporatism' or 'the third way'. This proposal for corporatism is naively made, and would be ineffective, if not dangerous", says Freedom Party of Ontario leader, Paul McKeever...." Click here to read the full media release. "With the news that $91M of the McGuinty government's $200M bail-out to hospitals will be spent on severance packages for nurses, the Freedom Party of Ontario is proposing that Ontarians be given the option of buying private, for profit health care, instead of paying for the government's plan through taxes....." Click here to read the full media release. "With Progressive Conservative Party of Ontario leader, John Tory, saying that Finance Minister Greg Sorbara should step down over the alleged accidental release of Social Insurance Numbers, Freedom Party of Ontario leader, Paul McKeever, is expressing concern...." Click here to read the full media release. "With Ontario's film workers preparing for a demonstration at Queen's Park on Wednesday, December 1, 2004, Freedom Party of Ontario leader Paul McKeever is urging Premier McGuinty not to increase tax credits and taxpayer funding to the industry...." Click here to read the full media release. "On the 11th hour of the 11th day of the 11th month, we pause to remember those who have participated in military action to deny the food of good to the hunger of evil..." Click here to read the full media release. "...The election of John Tory to the leadership of the Ontario Progressive Conservative Party is the outcome that Freedom Party of Ontario has anticipated since 2002, when the red tory majority of the PC membership ejected the common sense agenda of the Mike Harris government, and sidelined his supporters within the party..." Click here to read the full media release. "...McGuinty had a chance here to win back the private sector's confidence, and to give a spark of hope to Ontario's electrical future: he just blew it", said McKeever..." Click here to read the full media release. As the election winds down to a predictable close, many writers are complaining that there is nothing to write about. Freedom Party of Ontario Leader Paul McKeever is suggesting the time is right to write about Ontario's absurd, fraud-prone voting system...." Click here to read the full media release. In today's Toronto Star newspaper, Ernie Eves was quoted by Ian Urquhart as saying, with approval, that 'The future is the future that Paul Martin sees'...." Click here to read the full media release. His PCs 17 points behind the provincial Liberals, Ernie Eves last night attempted to associate his Ontario PCs with the future of the federal Liberal party, and Dalton McGuinty's Liberals with its past...." Click here to read the full media release. Freedom Party leader Paul McKeever will join with a number of Freedom Party of Ontario candidates from Toronto-area ridings to distribute Freedom Party's municipal funding reform plan flyer to the public, including many commuters who arrive at and depart from Union Station each working day...." Click here to read the full media release. Freedom Party leader Paul McKeever will participate in an Oshawa riding all-candidates forum including the NDP's Sid Ryan and the Liberals' Chris Topple...." Click here to read the full media release. Dear Misters McGuinty and Hampton, I am writing to warn you of a PC strategy that appears to be developing in this election...." Click here to read the full media release. Following a public consultation process, Freedom Party of Ontario is today releasing its plan to repair Ontario auto insurance...." Click here to read the full media release. Paul McKeever to file his candidacy papers for the Ontario Provincial election...." Click here to read the full media release. Having erred with anti-immigrant strategy, 'war criminals in Thornhill' comment digs hole deeper...." Click here to read the full media release. An election flyer released by Ernie Eves' Progressive Conservatives shows the PCs have been forced to run as a fringe partyng...." Click here to read the full media release. "Freedom Party of Ontario's "True Blue" election sign campaign has begun. Freedom Party candidates will be running deep blue signs with white lettering...." Click here to read the full media release. The Freedom Party of Ontario today began distribution of its 4-page "Just Blow Me" / "Don't Blow it Again" political advertisement by distributing the first 130,000 copies through the Ontario circulation of today's National Post newspaper..." Click here to read the full media release. "The Freedom Party of Ontario today began distribution of its 4-page "Just Blow Me" / "Don't Blow it Again" political advertisement by distributing the first 130,000 copies through the Ontario circulation of today's National Post newspaper..." Click here to read the full media release. "With an election call anticipated to be days away, Freedom Party of Ontario candidates, with party leader Paul McKeever, will go to the heart of Ernie Eves territory - Bay Street - to distribute an elaborate four-page political advertisement" Click here to read the full media release. "Eves is doing Ontario a real disservice here", says Freedom Party of Ontario leader, Paul McKeever. "The Federal and Provincial governments are not in a parent and child relationship: they are, instead, parts of a two-piece puzzle. Every time Eves begs the federal government for money he reinforces the false perception that the feds run the show. The reality is quite the opposite. Mike Harris knows that. Ralph Klein knows that. Preston Manning knows that. I, most certainly, know that." Click here to read the full media release. "The PC party's common sense experiment with free market solutions is ended, and the party has returned to the government-knows-best attitude that led the PCs to nationalize hydro, monopolize health care, and impose price controls and subsidies on everything from rent to auto insurance..."At this point," says McKeever "advocates of free market economics who end up voting PC in the coming election are probably best understood as having Battered Tory Syndrome." Click here to read the full media release. "On Thursday morning, Ontario Premier Ernie Eves gave a press conference. As he did on the CBC earlier this week, he attempted to mislead the press and the public concerning Ontario's electricity self-sufficiency..." Click here to read the full media release. "...a premier can either be disliked for cutting power even to people who are using hardly any, or he can be disliked by big-time power consumers for taking away daddy's credit card. I recommend to you the capitalist method: eliminating, as soon as humanly possible, the 4.3 cent price cap. Here are a few reasons why..." Click here to read the full letter, which was cc'd to the media in a press release. "Ontario Premier Ernie Eves intentionally misled the public last night. On Sunday, Eves stated "My goal is to make Ontario self-reliant in electricity", and explained that his plan includes increasing the supply of electricity. When later asked to reconcile his plan to make Ontario self-reliant with his claim that Ontario is already self-sufficient..." Click here to read the full press release. August 6, 2003: Repairing Ontario Auto Insurance: Ending Compulsory No-Fault? Fp today released its draft policy on automobile insurance for public consultation. Your feedback is invited. Click here to get your copy of the draft. Click here to read the media release. July 11, 2003: U.S.A. Asks Freedom Party: Canada Friend or Foe? June 26, 2003: Wedgie Implemented, What Have You Left to Offer Ontario, Mr. Eves? May 15, 2003: Freedom Party Releases Election Platform: "The Right Direction"